10 Reasons why Rajkanya Baruah may be the brightest beauty at Miss India 2016! Rajkanya Baruah from Guwahati is Femina Miss India Kolkata 2016. She is one of the three confirmed contestants of Femina Miss India 2016 at the moment. She is a model from a long time and has been an active member of our TGPC Facebook group. She would often participate in the Pageant Questions contest in the group and win the episodes. Her answers are always impressive. The girl is brilliant and knows how to impress others with her words and wit, without even trying. Here are 10 demonstrations of her wittiness and brilliance. This girl may be unstoppable once she makes the final round. Final round is always about personality and communications, which seems to be Rajkanya’s forte. Intellect, poise, good body physical fitness, facial beauty, height, walk. The walk comes the last, because it’s something which can be taught or learnt easily! ‘It’s Hard To Be A Woman. You must think like a man, act like a lady, look like a young girl, and work like a horse’. What is your take on this? Being a woman is exhilarating, I think like a smart woman, act like a poised woman, look like a beautiful woman and work like a dedicated woman. A woman has many wings to her; to ace in multitasking! Are u a feminist? Some argue that men are being discriminated under the so called call for feminism. What do you think? Men and women were not made equal…women were not made to do what men can, they were made to do what men can’t and vice versa so I find the debate futile. Why do you think you should be the Next Femina Miss India? Femina Miss India title is not just about prestige and honor, but it comes with a responsibility. I will be an ambassador of goodwill to others, a role model of faith and good work, an example of gentleness and kindness, a portrait of calm and peaceful thinking and action, and indeed be an epitome of change. I will use my convincing aura of beauty to convince people to help others as I perform my duties as an ambassador of goodwill. What is the relevance of pageantry in this era? Do they contribute towards the progress of a nation? A beauty pageant is not just a celebration of beauty but it also encourages and empowers women to be themselves and foray ahead and excel in different paths of life confidently. Participating in a Pageant goes beyond just being a beautiful woman that we all know we are. It comes with a responsibility, with a right attitude to go beyond the physical aspects and garner awareness in the world about all the issues that need to be addressed to make not just us but also the world a beautiful place! It’s giving the word beautiful a whole new meaning and breaking stereotype and inspiring the ones watching the pageant as well.! 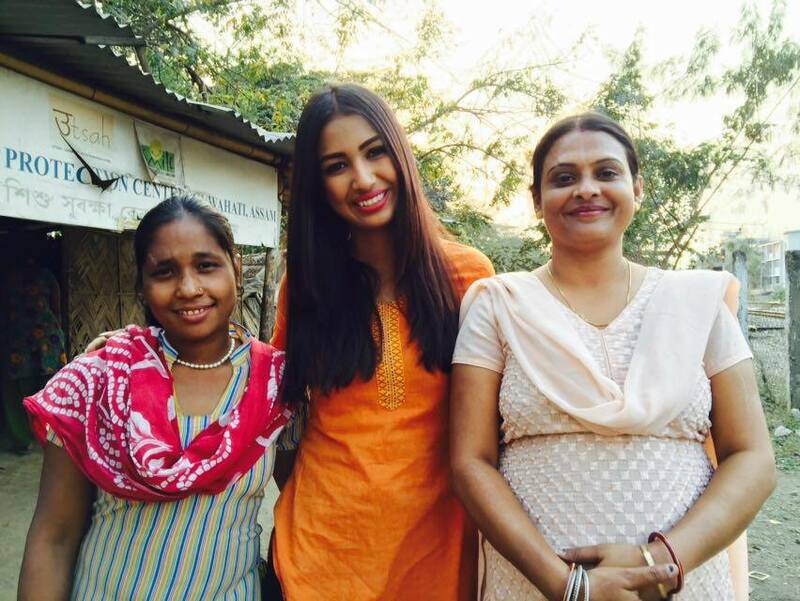 Rajkanya Baruah is already working on her “Beauty with a purpose” project which revolves around cyber-bulling. These days, we witness a lot of long term relationships breaking up and married coupled heading for divorce after a lot of years. If you were a judge dealing with such cases, what would have been your verdict and your thoughts regarding the same? The fragility of long term relationships and separation is a common scenario nowadays. The bitter truth that people choose to part ways rather than mending the shortcomings is the root cause of all broken relationships. A relationship I feel is built over three very important aspects: mutual trust, respect and love. If all three of these have been jeopardized, the relationship is at stake. Being a judge ,in the trial I would check if there’s trust, love and respect alive between them, they can opt for counseling because if either of the three aspects is there, the rest will follow; if not, than parting ways peacefully is the best solution rather than being a slow poison to each other. Former or the latter, either way the couple deserves the second chance; in the relationship or out of the relationship. What is your biggest fear and how do you plan to overcome it? The purpose of Life is a Life with a Purpose, and not being able to fulfil the purpose of my Life is what I fear the most in life. The only way to overcome this fear is by not forgetting the very reason for my existence in this world which is to garner peace, happiness and positivity to make this world a beautiful place to live in. Does society influence Bollywood or Bollywood influence society? If there were no rules in your life for one day and you could do something outrageous, what would that be? A Must-See Groupie from the wedding of Rolene Strauss!